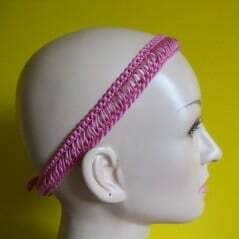 I took a slightly different approach to doing the broomstick lace in this crochet headband pattern.Generally you would gather several loops and work several stitches into the group. In this pattern, however, I chose to work 1 slip stitch into each loop stitch instead. Then I turned the work and came back with sc sts. This method helps to create a nice stretchy headband. Broomstick lace is very easy to do. You start the lace with the loop row, which is worked from left to right. This means that you do not have to turn your work. To do the loop row, you simply take your active crochet loop and place it onto a knitting needle. Then you insert the hook into the next stitch, draw up a loop and place it over the knitting needle as well. You keep doing that until a loop has been pulled up in each stitch across. Then to work the next row, you crochet your loops off the knitting needle starting from right to left. 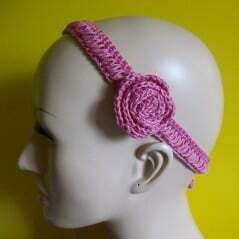 You can use the clip to help keep the hair in place or as an added decoration for a headband. Click Here for mini rose hair clip pattern. Gauge: Measures approximately 1″ across 5 stitches. Row 1: Sc in second ch from hook and in each ch across. Do not turn. Row 2: Slip the active loop onto the knitting needle, *draw up a loop in next st and place it onto the knitting needle, repeat from * to end. Do not turn. Row 3: Slip the first loop off the knitting needle, yarn over and pull through the loop, ch 1, *slip the next loop off the needle and work 1 sl st into the loop, repeat from * to end. Turn. Row 4: Ch 1, sc into each sl st across. Fasten off.